Description: Despite her best intentions, Kick Keswick—international jewel thief, fabulous dresser, gourmet cook, and woman-about-town—finds herself drawn into the glamorous, dangerous world of jewels (and the people who covet them) . . . It should have been the start of a perfect sojourn in Provence. Kick Keswick had just settled down to warm chocolate soufflé with a decadent Grand Marnier sauce and a small glass of Armanac when she received startling news: The personal jewels of the Queen of England herself have gone missing. And she wants Kick to get them back. Most of the world knows Kick as an expert in jewels and antiquities, having been the right hand at Ballantine & Company Auctioneers in London, but others know Kick as the world's finest jewel thief, a woman who can stand out in a crowd at will, but who can also blend in when she wants to. Kick desires nothing more now than a quiet life, but Her Majesty requests her expertise (and Kick's vanity is more than tickled). So the chase is on, in a race that takes her from Provence to Paris, London, St. Moritz, and Milan - and puts all her wiles and talents to the test as she faces a thief whose skills match her own. And with Kick Keswick on the case, there will be trouble afoot - of the multifaceted kind. 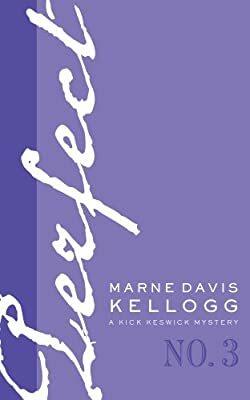 "Kellogg's focus tends be on the luxurious food, clothing and jewels of the heroine and less on the mystery at hand, but it works. It is all part of a well-developed and charismatic character. Kick is why we are reading the novel and the mystery at hand is really the sideshow. . . Kellogg is a master at detective novels. With this addition to her Kick Keswick series, "Perfect" is just that." "The author has truly hit her stride in this series, which she writes with an arch tone and a terrific sense of humor. PERFECT is her third romp through the lifestyles of the rich and reclusive - those who have not just money but good taste. It's a fantasy set in a private Swiss resort, with mink-trimmed Bogner outfits, enormous jewels and lines such as "Your sleigh is here, ma'am." PERFECT is a perfect chocolate soufflé - one of Kick's signature dishes because, of course, she's also a gourmet cook - airy, light and delicious."